Artists have been using mechanical aides since the beginning. Variations on the idea go all the way back to the Egyptian ‘canon of proportions’. Grinds are a classic way to break down the picture plane, compose space, alter and record it. Archaeologists use them too, in order to document the spatial relationships of dig sites on their maps. They are a key component to all mapping. For artists they can be a tool. A gateway to representational accuracy or interesting constraint. Master artists of the Renaissance, would draw on paper to complete designs for fresco commissions. The final paintings were enlargements of smaller drawings used to develop and plan the mural and gain approvals from his patron. Those smaller sketches were often blown up using a grid on each to enlarge the scale of proportions in the copy. The final illustrations would be transferred to an area of damp plaster to be painted before the plaster dried. This was not the first use of grids to gauge and govern proportions. Another interesting contraption from the same era, called Drawing Engines were employed to study perspective and obtain a truer likenesses of foreshortened forms. A favorite tool of the first Modern Artist and Printer, Albrecht Dürer. These Engines were grids made of wire or string strung across a frame. The artist looked through one from a fixed point using a site – a ring placed near him to fix his point of view through his Drawing Engine. It’s much like using your thumb or pencil to gauge scale and proportion. Notably Chuck Close has exploited them extensively in his paintings to both ends, enlarging his portraits first invisibly using grids behind the scenes as a photorealist. Then later overtly exposing his grids to subdivide the picture plane into abstracted pixels in his Figurative Expressionist phase. I’m going to include a cool documentary about his work here. 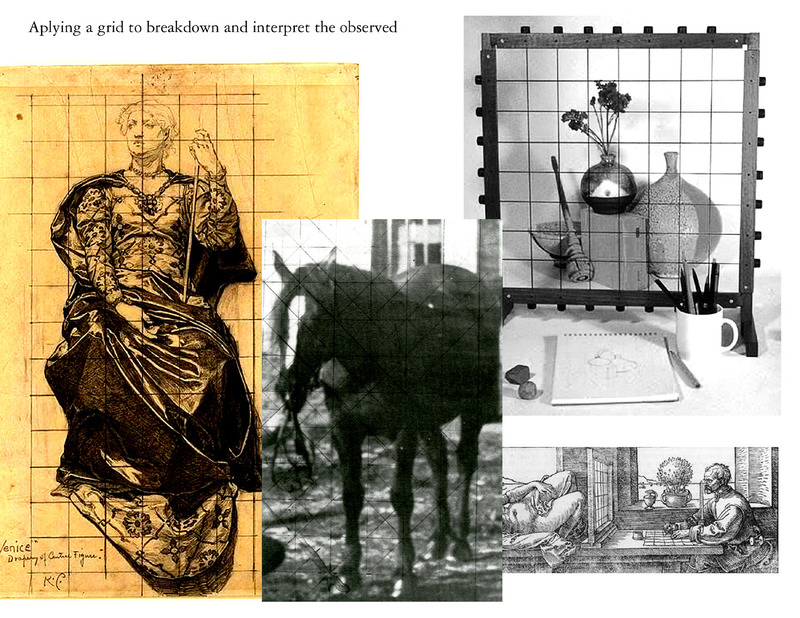 When we are looking to study the way things appear, using grids to subdivide images and compose the picture plane can invaluable as an exercise. Try drawing over photos to analyze reference material and study composition and proportion. Consider how proportionate rules of thumb like the Golden Mean might apply to the image. [study aid: a set of classic illustration with it applied to it posted on the site.] Consider how you can edit a composition to exploit them in the work, and look at how those changes compare. Doing Photomontage is a fun way to experiment with composition outside of drawing. And last when doing our life studies, Measuring a little is important in observing and learning proportions! Don’t just stare at the subject, hold out something to use to compare one part to another. 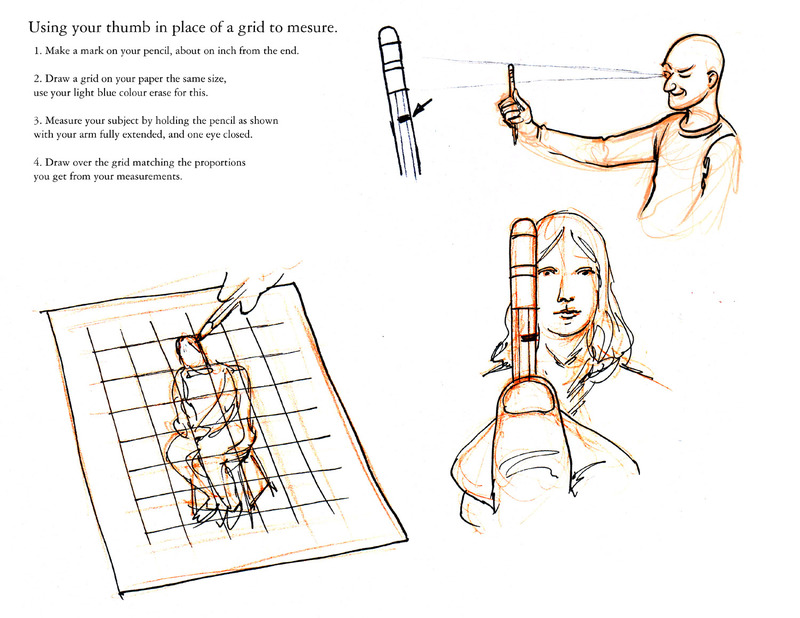 A common and often far more handy way to draw from life without the full Drawing Engine contraption is by measuring with your pencil. Optionally you can draw a grid on your paper, but often keeping the system more open as demonstrated in this cool Proko·clip, and using the handiest small constant measuring tool that’s already in your hand! I call this thumbing it personally because I’ll use my thumb sometimes too. The distance between tip and the first joint is about one inch, neatly matching an inch square grid. But I often draw a mark on the end of my pencil an inch from the top to utilize it in the same task. And you often want to just use the tip and your finger to measure of various portions on the fly rather than anything fixed. For Live Dynamic Gesture Drawing you favor expression over accuracy, and try to maintain more expression. But when you’re first visually studying the subject feel free to hold up your pencil at an arms length and study the proportions of your subject. Finding the wrapping for the area of the study is a good way to think about looking for the expressive overall gesture of the movement [“Describe the body, its transit through space, and the overall form the body makes throughout the movements,“]. Look for plum lines, foreshortened limbs, and the negative spaces. Measure them quickly with your eye and pencil. Remember to apply your experience so far rendering anatomy [20 anatomical drawings in light blue] to see what the muscles and bones are doing, so that you can better described what the surfaces are doing with an informed eye! 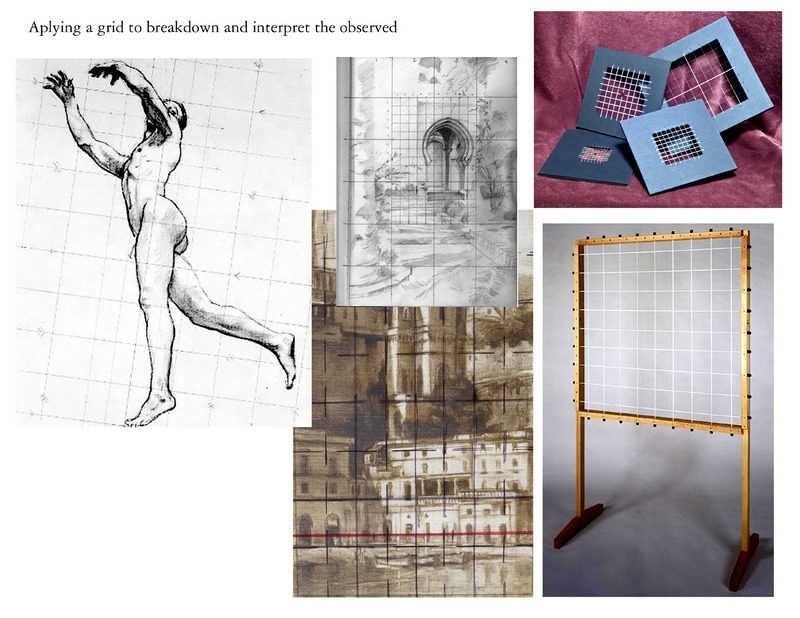 31/12/2013 | Filed under Class Blogg, Class Resources and tagged with composition, grid, perspective, practice, tutorials.